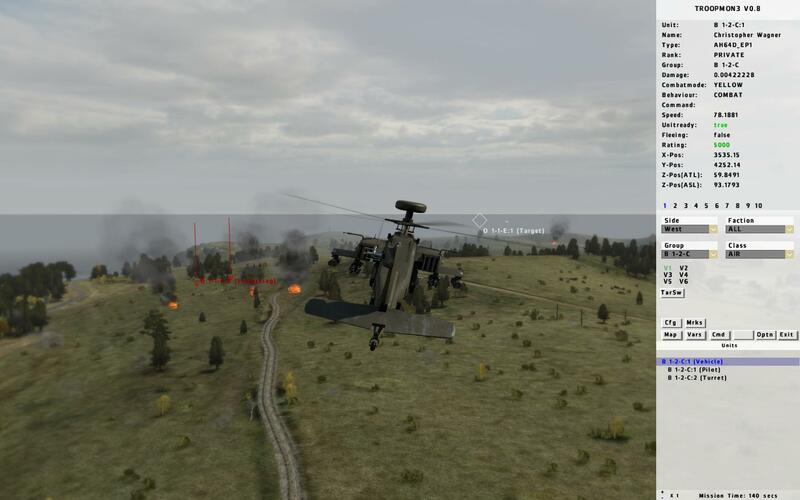 This is TroopMon3 for Arma2. TroopMon1 was first written for Arma1 way back and served many mission makers to debug their missions. TroopMon2 then followed for Arma2. TroopMon3 is a reworked version of TroopMon2, that i decided to write to more efficiently debug the undead2 mod. It was completely re-written and narrowed down to essential features for best performance. the combat behaviour of the placed units in their missions. and achieve mission objectives with a minimal troop-count. Missions with uncertainty about the location of the involved units are a thing of the past. 3. A gunner's view through the ironsights of the watch-unit's weapons. 4. A 1st person view to find out where the watch-unit is looking at. 5. A 3rd person view that cycles through a random selection of units. primarily, units that are in combat are shown. - Total overview of all mission relevant AI variables. with the ability to switch the view to that enemy to evaluate it. Unit-count battle situations, selections can be made with the mouse. All status data can be shown or hidden by little toggle switches. unit has in a specific situation. of TroopMon3 that you choose via your own scripts. Make sure to check out the demo mission scripts to grasp the possibilities for customization. Thanks. was waiting for some time for NÂ° 3 release. Once again thanks for your hard work and effort. Does anybody have a copy of this lying around? Seems all the download links (here & armaholic) are down. Would very much like to use this, as the A2 version was really helpful. The second link on Armaholic works just fine.